FILE - Supporters of Taiwan's ruling KMT or Nationalist Party presidential candidate Eric Chu cheer during a campaign rally in Taoyuan City, Taiwan, Sunday, Jan. 10, 2016. Taiwan will hold a general election Saturday to elect the 14th president and vice president of the Republic of China, and all 113 seats of the 9th Legislative Yuan. Eric Chu is the mayor of Taiwan's most populous metropolis, New Taipei City, and chairman of the ruling Kuomintang party (KMT). Chu entered the 2016 presidential race late. 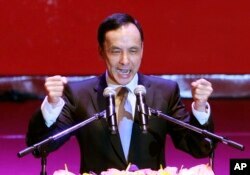 The KMT drafted him in mid-October last year, replacing a female candidate on the ticket. Chu is viewed as a staunchly pro-China candidate. Like outgoing President Ma Ying-jeou, he favors building strong relations with Beijing on the basis of the “1992 Consensus,” in which both sides insist there is “one China” but agree to disagree on what this means. Taiwan's ruling Nationalist Party chairman and presidential candidate in the 2016 elections, Eric Chu, gestures during an extraordinary party congress in Taipei, Taiwan, Saturday, Oct. 17, 2015. Tsai Ing-wen is the head of the opposition Democratic Progressive Party (DPP). She was Taiwan's first female presidential candidate during the 2012 presidential race, which she lost to Ma. She has been the frontrunner in polls leading up to the elections and is widely expected to win Saturday, becoming Taiwan’s first female president. She was one of the chief drafters of the "special state-to-state relations" doctrine of former president Lee Teng-hui, which defined Taiwan and China's relationship on country-to-country terms, angering Beijing and leading to heightened tensions. She has since moderated her views, promising to maintain peaceful and stable relations if elected. James Soong is the founder and chair of the smaller People First Party (PFP). 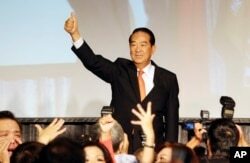 Taiwan's People First Party Chairman James Soong gives a thumbs-up to supporters as he announces his candidacy in the January 2016 presidential election, in Taipei, Taiwan, Thursday, Aug. 6, 2015. The KMT currently holds 65 of the legislature’s 113 seats, all of which are up for grabs on Saturday. It needs to retain 57 of them to keep its majority. Most of the seats are chosen by geographical districts, but 34 are filled by the parties based on the national vote and six are reserved for aboriginal constituencies. Polls show the KMT risks losing its majority for the first time in Taiwan's history. Cross-Strait relations: As in past elections, the crucial political issue is China, and whether Taiwan’s future lies in a closer relationship with its giant neighbor or an autonomous identity. China claims Taiwan as part of its territory and sees the unification of the country as a central goal. Under the pro-reunification KMT government, cross-strait relations reached a high in November 2015, when Ma met Chinese President Xi Jinping in Singapore, heralding the first meeting between the top leaders of Taiwan and China since the Chinese Civil War in 1945. 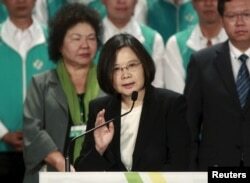 But even though Tsai has pledged to keep the relations status quo if elected, there is no guarantee she will be able to contain DPP members that take a more hardline approach to Taiwan independence. Domestic concerns: The island's economy is expected to play a major role in the outcome. The past eight years of Ma's presidency has seen increased trade ties with China, but that has not proven profitable for the island. As China’s growth has slowed, Taiwan’s economy has plummeted, contracting over the most recent quarter. Gross domestic product growth for 2015 is expected to be just 1 percent. Wages are also stagnating, even as companies make profits, leaving many to believe it's mainly businesses, not ordinary people, which have benefited from the closer trade ties with China. The Central Election Commission of Taiwan will begin to post results on its website after polls close. The new legislature will be seated on February 1. The victor in the presidential race will not take office until May 20.